This thoroughly modern, automobile-themed take on England’s mysterious Stonehenge stacks 38 gray spray-painted cars up in a life-size replica of the ancient structure. Archeologists still don’t know why Druids built the original, but the origin of the Alliance, Nebraska, installation is straightforward. Fascinated by Stonehenge, artist Jim Reinders created this Midwestern version in 1987 as a memorial to his father, who lived on a farm where Carhenge now stands. The effort was no small feat: 35 of Reinders’ family members and friends rescued cars from nearby dumps and teamed up to build the structure, which meant burying some cars, trunk down, 5-feet deep in the soil. Today, the memorial is a weird, all-American road trip destination with more than 80,000 tourists pulling off of Country Rd. 59 to snap photos of the vintage vehicles in the middle of a wheat field. Next door, a visitor center and car art park showcase various statues, including the “Spawning Salmon,” a giant metal fish leaping out from the ground. Carhenge is free to visit 24-7; the visitor center is open from 10am to 5pm Monday–Friday. This 90-ton, 65-foot-tall wooden elephant overlooking the beach in Margate, New Jersey, is essentially a 129-year-old publicity stunt. More commonly known as Lucy the Elephant, developer James V. Lafferty, Jr. built the colossal structure in 1881 to snag attention and shake up his local real estate business. Yet, after more than a century, Lucy still hogs the spotlight. She is America’s only lasting example of “zoomorphic architecture,” has housed a tavern and a private home, and has survived two hurricanes, a lightning strike, and a serious wrecking-ball threat. When developers planned to tear Lucy down in 1970, concerned admirers banded together to move her to a vacant beach two blocks down Atlantic Avenue. It took seven hours for a pickup truck to tow Lucy down the street and set her up at the shore, but she later landed a spot on the National Register of Historic Places and is a weird – but lovable – Jersey girl that’s here to stay. Today, visitors can climb up Lucy’s gams for a tour of the oddity and a one-of-a-kind ocean view. Entry from $6; Open Mid-June–Labor Day, Monday–Saturday 10am–8pm, Sunday 10am–5pm; off-season, Monday–Friday 11am–4pm, Weekends 10am– 5pm. The Marfa Lights have baffled scientists since the first recorded sighting in 1883. Visible only on clear nights, the weird yellowish-green orbs float, bounce around, and vanish then reappear over the Mitchell Flats, just outside of Marfa, Texas. Explanations range from the mundane (mirages, car taillights) to the otherworldly (alien spacecrafts, displaced souls), but the fun of these inexplicable lights is certainly in the mystery. Each Labor Day weekend, Marfa residents celebrate the phenomenon at the Marfa Lights Festival. The three-day fest – complete with live music, street parties, and local arts and crafts vendors – kicks off with a Friday night parade and has become a reunion for former Marfa residents and mystery lights fanatics alike (there are several full books on the topic, by the way). Year round, visitors flock to the viewing center, about 10 miles east of Marfa, for a glimpse of the mystifying glows. Free; viewing center is open 24-7. A weird sight since the 1930s, the Oregon Vortex and its so-called “House of Mystery” in Gold Hill, Oregon, earned its first slice of paranormal fame when it debuted on a 1999 episode of The X Files. What causes the disarming slant in the house? Why do brooms stand up on their own here? Despite Agent Mulder’s suggestion that something supernatural was brewing, skeptics swear the vortex is some kind of optical illusion or a glitch in magnetic fields. 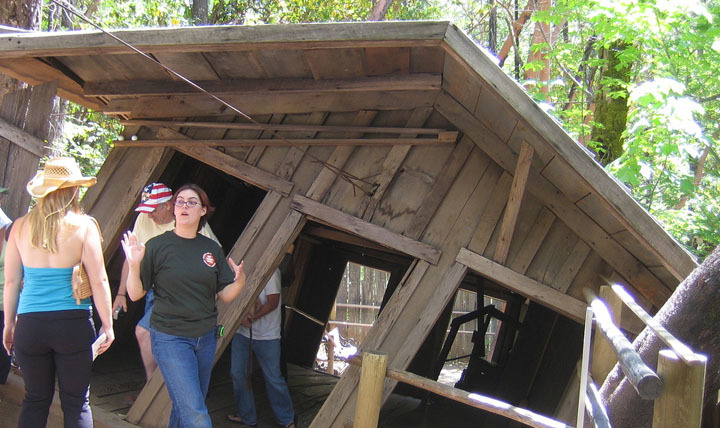 The attraction centers around one severely tilted mining shack that slid from its foundation just a few years after it was built in 1904. Paranormal or not, the vortex is a funhouse of physics-defying experiments: water bottles appear to roll uphill, visitors seem to shrink or grow with every step (though everyone leaves the same height! ), and everything hangs at a perplexing angle. Admission from $9.50; March–May and September–October, daily from 9am–4pm; June–August, daily from 9am–5pm. 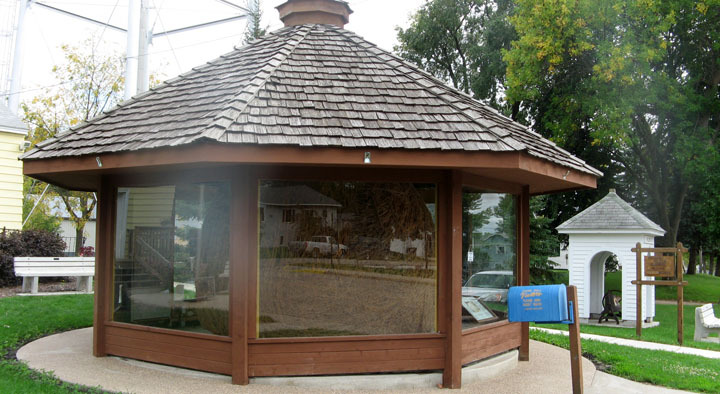 Perhaps the most classic of all weird roadside sights is the world’s largest twine ball, built by one person, in Darwin, Minnesota. Why a large ball of twine? Well, it all began in 1950 when Francis A. Johnson started wrapping twine for four hours each day for 23 weeks. What motivated him? That we don’t know but by the end of the fourth month, he needed a crane to lift his creation – but that didn’t stop him. He continued on spinning until his death in 1989. The ball eventually ballooned to 40 feet around, weighing 17,400 pounds, and is now on display in a covered gazebo in downtown Darwin. Each August, the city celebrates the ball with its Twine Ball Days Festival, but visitors can spin their own yarns year-round with twine ball kits sold at the onsite museum (cranes not included). Free admission; open daily, April 1–October 31, 9.30am–4.30pm; free off-season tours available by appointment. Red eyes and snow-white fur make albino squirrels look like something out of a sci-fi movie, but in Olney, Illinois, the rodents might as well be royalty. City laws give these rare white squirrels the right-of-way on every street (jay-walking permitted), and police prohibit visitors from leaving town with one of the estimated 111 colorless pets. Albino squirrels scurry down trees in towns nationwide (at least five other American towns boast similar populations), but Olney provides something of a safe haven for the animals, who don’t exactly blend in like their camouflaged counterparts. Besides street-crossing privileges, these little guys can escape winter weather in citywide squirrel houses (wooden huts that locals nail to trees) and officials even encourage visitors to feed the squirrels – only nuts, seeds, and fruit, of course. For guaranteed sightings, visit on Saturdays in October (this year’s schedule is set for October 9, 16, and 23) when a citywide squirrel census takes place (volunteers actually go around counting the number of white and gray squirrels to keep track of the population). A town hunting for squirrels seems like an even weirder sight! Otherwise, find a park bench at Olney City Park, scatter a few nuts on the ground, and wait, camera at the ready.